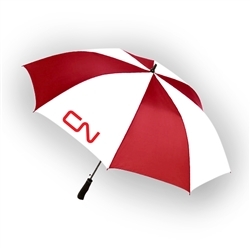 Red/White Umbrella; 64" arc dual canopy with anti slip rubber handle. CN logo printed on one panel. Opens automatically with the push of a button. Maximum coverage. Lightweight fiberglass shaft and ribs. Matching sleeve included.